NordVPN's speed, Netflix-unblocking abilities, P2P-optimized servers and Bitcoin support make for an appealing service. The app interfaces need work and there’s room for improvement with support, but overall this is a quality VPN with plenty to offer all levels of user. NordVPN is a Panama-registered service that provides VPN products for more than a million customers. The company sells itself very much on features, and it's easy to see why. The VPN offers 5,400+ servers in 61 countries. You get Windows, Mac, iOS, Android, Linux and other apps. And with support for six simultaneous connections, you can probably use all your devices at once. There are all the technical features you'd expect, including OpenVPN support for strong encryption and high performance, a kill switch and DNS leak protection to keep your identity safe. Not-so-common extras include double data encryption and Onion support for extra security, and ad, malware and phishing protection via NordVPN's CyberSec technology. P2P support is a major plus, and a clear no logging policy and NordVPN's Panama registration give above-average reassurance that your internet activities won't be visible to anyone else. NordVPN reports some significant improvements since our last review, including improved app interfaces, faster speeds, enhanced encryption, and a public audit of its no-logging policy performed by Price Waterhouse Cooper. The company says it's testing the new Wireguard protocol, too, although there's no date for its likely availability, yet. If you're intimidated by this feature overload, or just run into some unexpected problems, NordVPN's 24/7 support is on hand to point you in the right direction, via email or live chat. Prices are fair, and if you're not quite convinced that this is the VPN for you, a 7-day trial allows you to sample the service for yourself. NordVPN has a clear and simple pricing structure with four straightforward plans. You can opt to pay $11.95 a month with the monthly plan, an effective $6.99 a month (a chunky 41% discount) if you pay for a year up-front, dropping to only $3.99 with the two-year plan, and a very appealing $2.99 over three years. These are excellent prices which match most of the quality competition. NordVPN isn't just outperforming premium services like ExpressVPN, for instance ($8.32 for the annual plan), it's also closing on budget offerings such as Private Internet Access ($3.49 over two years – and indeed NordVPN is cheaper if you commit to three years). Each plan is clearly described, with none of the sneaky marketing tricks you'll often find online. There's no misleading headline rate, no discounts which disappear on renewal, no need to sign up for years to get what you're promised. The website simply tells you the effective monthly rate, the billing frequency and the total you'll pay each time, ensuring you understand the deal before you click 'Buy'. The positive impression continued as we worked through the signup process. There's no need to hand over all your personal information, as NordVPN only wants your email address. And even NordVPN's payment options are better than most, with support for cards, PayPal, Bitcoin and other cryptocurrencies (via CoinPayments), and assorted other systems (Alipay, UnionPay, SOFORT Banking and more). Once you do sign up, you're also protected by NordVPN's 30-day money-back guarantee. Forget the sneaky clauses you might have seen with other services, where for instance you won't get your money back if you've logged on 'too many' times, or transferred 'too much' data. We found no attempt to catch you out, so you're able to use the service as much as you like, and if you're unhappy, cancel in the first 30 days and you'll get a full refund. The privacy value of all VPNs starts with the support for encryption technologies. NordVPN scores well here for its strong IKev2/IPsec support. This gets you AES-256-GCM for encryption, and supports perfect forward secrecy to regularly change keys (this time using 3072-bit Diffie-Hellman), ensuring that even if an attacker manages to penetrate one session, they'll be locked out of the next one. It's an excellent system which is now NordVPN's default for Mac and iOS, and is also available in some of the other clients (including Windows). NordVPN's OpenVPN apps have also been updated to AES-256-GCM from the previous AES-256-CBC. This isn't exactly a security revolution - the standard AES-256-CBC offers very capable protection - but it does give the service a technical lead over most of the competition. Once you're connected, NordVPN has other tricks it can employ to improve your privacy. These include Onion over VPN, which routes your traffic first through NordVPN's own network, then directs it over the Onion network and on to its final destination. This double layer of obfuscation will slow the service down, but also makes it extremely difficult for anyone to trace an action back to you. Best of all, you don't have to know or understand anything at all about Onion to make this work. There's nothing to install or set up, just use your client to connect to one of NordVPN's specialist Onion over VPN routers and the system will handle everything automatically. NordVPN also offers a Double VPN system where your traffic goes to one VPN server, then is re-encrypted and sent to a second NordVPN server, before being sent to its destination. This isn't going to be necessary, or even useful for most people, but it's there if you can find a reason to use it, and the technology doesn't slow you down as much as you might expect. A quick check on our review system showed download speeds of 70Mbps when not connected, 45Mbps when using the best Double VPN for us (UK to France). However you're connected to NordVPN, its kill switches work to prevent any data leaks if the VPN connection drops. NordVPN stands out here for having two kill switches. A general internet switch blocks all net access when you're not connected to the VPN (this can be easily turned off if it's inconvenient), while an app kill switch kills your chosen applications if the connection goes down. NordVPN claims the service blocks DNS leaks, too, and our checks with DNS Leak Test, IP Leak and other sites confirmed this. Our DNS address was always the same as our IP address, with no DNS, WebRTC or other leaks detected. "NordVPN strictly keeps no logs of your activity online. That means we do not track the time or duration of any online session, and neither do we keep logs of IP addresses or servers used, websites visited or files downloaded." That covers not only general logging of your internet activities, but also session logging details such as recording your incoming IP address when you connect to the service, and the IP you're allocated. (When other VPNs say 'no logging', they often carry out some form of session logging, so it's good to see NordVPN rule it out). In this case, though, we found absolutely no privacy-related surprises, at all. The company does keep some additional information about you, but there's nothing you wouldn't have guessed already (email address, payment information, messages you might send to customer service, cookies on the website). And you could minimize even this level of disclosure by, say, using an email for VPN signups alone, and paying via Bitcoin. Best of all, and unlike most of the VPN competition, you don't have to trust the company's claims. In late 2018 NordVPN hired Price Waterhouse Cooper to run an independent audit on its infrastructure and services, and verify that its logging policy description is accurate. A November 2018 blog post confirmed that the company had passed. The report doesn't have much in the way of technical detail. There are lots of legal restrictions on the content, too, and for instance we can't even quote from it. NordVPN customers and trial users can take a look, though, and we have to applaud the company for taking this step. It means NordVPN has far more evidence to support its no-logging claims than just about any other VPN provider. While privacy features are normally the top priority for a VPN, performance is almost as important. Uncrackable encryption isn't nearly as appealing if it reduces your internet speeds to a crawl, which is why we put all our review VPNs through some intensive performance tests. Our checks began in the UK by connecting to a sample set of more than 50 NordVPN servers spread around the world. In each case we were looking to confirm that the server was up and how long it took to connect, before running ping tests to check for latency issues, and using geolocation to confirm that the server was where NordVPN claimed it should be. None of these would give us specific information on download speeds, but they're all important factors in the experience of using NordVPN. These first tests showed an above-average number of connection issues, with 4 servers failing to connect after even two tries. Any VPN will have problems, occasionally, but as NordVPN had a similar proportion of connection failures during our last review, it looks this is an ongoing minor issue with the service. Once we were online, though, NordVPN performed very well. Connection times were speedy, latencies were minimal, and every server was in its advertised location. We ran further speed tests by using Netflix's fast.com to check the performance of four sample location sets: 10 servers in the UK, 13 in the US, 12 across Europe and 18 scattered around Asia and Australia. It's unwise to trust any single speed test, so we cross-checked our results with Open Speed Test and Ookla's Speedtest. All checks were run on a Windows 10 system via a 75Mbps fiber broadband line. The results were generally very impressive. Our test connection normally achieved around 72Mbps, and going via a UK VPN barely made any difference, with speeds reaching a very consistent 67-68Mbps. Near European servers also delivered, with speeds of 50-65Mbps, depending on location. Performance tailed off a little in a few locations, for instance with Greece and Poland down to 30Mbps, but even these were fast enough for most purposes. The US also scored well for the most part, with east coast locations giving us 60-65Mbps, falling to around 50Mbps when connecting to California. Switching to our long-distance 'Asia Plus' group finally revealed a few problems, with download speeds becoming less consistent and occasionally dropping to 5Mbps in a few locations (Malaysia, Thailand). Most servers performed much better, with 40-50Mbps available in Singapore, 40Mbps in Japan and 25-30Mbps in Australia, but NordVPN speeds still lagged some of the top contenders. US peak performance was excellent, with speeds ranging from 90-100Mbps. Asia and Australasia performance matched what we'd seen from the UK, with a peak of 45Mbps when connecting to Australia, dropping down to 5Mbps for Malaysia and Indonesia. Put this all together and NordVPN delivers exceptionally high peak speeds, while managing above-average results in most areas, but it can't quite manage the speeds and consistency of the best of the competition, such as ExpressVPN. The ability to access geoblocked websites is a key advantage of any VPN service. NordVPN doesn't explicitly claim to unblock any particular website or service, but statements that it allows you to "keep access to your favorite websites and entertainment content, and forget about censorship" sound good to us. Measuring a VPN's unblocking abilities is a challenge, especially when it has a network as large as NordVPN, but we've developed an automated test program to help. This can cycle through as many server files as we give it, and we then check whether that location gives us access to US Netflix, US YouTube or (for UK locations) BBC iPlayer. Unblocking YouTube is as easy a task as you'll get, but we check it anyway to confirm a VPN is doing something useful. And sure enough, NordVPN is, with the site giving us full YouTube access on every one of its servers. BBC iPlayer is more difficult, as the service makes a real effort to block some proxies and VPNs. NordVPN's Manchester servers couldn't get us in, but its London servers allowed us to stream whatever content we liked. Netflix is usually the biggest challenge, and many VPNs can't unblock it at all, but again, NordVPN had no issues, successfully allowing us in with every server we tried. That's a very good performance, and although it doesn't prove NordVPN will unblock other websites, its large network and wide range of security, privacy and encryption tricks give you a better than average chance of success. VPNs generally don't shout about their P2P support, and NordVPN is no exception. Although the company claims to be the 'Best VPN for P2P', the front page of the website no longer mentions its P2P status at all. Torrents aren't supported on all servers, but the company doesn't restrict you to a couple of options in Amsterdam, either. NordVPN provides hundreds of P2P-friendly servers in the US, UK, and many other locations around the globe. Wherever you are, there should be a suitable server nearby. VPNs which only support some P2P on some servers can be inconvenient to use, particularly if you connect to a non-P2P server, launch your torrent client and find it doesn't work. But NordVPN is smarter than you might expect, and if it detects P2P activity, it can automatically re-route your connection to a torrent-friendly alternative. NordVPN points out that it doesn't have any bandwidth limits, so in theory you can download as much as you like. The service small print includes a fair usage-type clause stating that you must not "take any action that imposes or may impose an unreasonable or disproportionately large load on our infrastructure", which might allow the company to take action against very heavy users. But many services have something similar, and we've seen no reason to believe that NordVPN has used this unreasonably. Along with its direct P2P support, NordVPN has a number of other features which could make it a good torrenting choice: a strict no logging policy, multiple layers of DNS and traffic leak protection, payment via Bitcoin and other cryptocurrencies, and privacy extras including Double VPN and Onion Over VPN. It's a strong all-round package, although if you're a torrent fan, ExpressVPN is also worth considering. The core features are similar, and while ExpressVPN doesn't have quite as many extras (no Double VPN, for instance), it supports P2P on all its servers and is arguably easier to use. Sign up for a VPN and you'll probably want to install a client and try it right away. Some providers make this more difficult than it needs to be, but NordVPN does a very good job. Tap the VPN Apps link, and the website automatically offers you the client download link for the device you're using, presenting you with further links for its other supported platforms: Windows, Mac, Android, iOS, Linux and Android TV. A lengthy list of more than 50 tutorials explains how to manually set up the service, and includes coverage of many other platforms and device types (Chrome OS, Windows Phone, Raspberry Pi, routers, NAS devices, more). There's far more detail here than you might expect. NordVPN has no less than 11 Windows tutorials, for instance, covering installing the regular client, OpenVPN, or manual setup guidance for various protocol types on Windows XP, 7, 8 and 10. Or maybe you want to know how to set up NordVPN as a Socks 5 or browser proxy? No problem: there are tutorials covering Chrome, Firefox, Opera, Safari, uTorrent, BitTorrent, Vuze, Skype, Deluge and more. It's not all good news. If you're connecting via OpenVPN, you'll want to download the appropriate OVPN configuration files, and as NordVPN has one of these per server, you'll end up with more than 10,000 of these in a single folder. NordVPN's own tutorials point to why this is a problem, stating that: "OpenVPN GUI... only supports up to 50 configuration files present in the /config/ folder. Thus, you’ll have to copy only a few configuration files to that folder. Since each file represents a server, you’ll have to know beforehand which servers you’ll want to connect to." The issue here is that the server file names use only two characters to identify the country, which might occasionally leave you wondering. Even when it's obvious, you're left browsing literally hundreds of consecutively-numbered US servers, for instance (us2372.nordvpn.com.udp.ovpn, us2373.nordvpn.com.udp.ovpn, us2374.nordvpn.com.udp.ovpn), with no clear visual cues as to which cities these represent. This isn't exactly convenient, and most providers use much more straightforward file naming conventions (ExpressVPN uses names like 'my_expressvpn_usa_-_new_jersey_-_1_udp.ovpn'.) Still, it's not a huge deal. If you use OpenVPN, you'll only have to figure this out once; if you don't, you won't even realize there's an issue. NordVPN made it quick and easy to install the Windows client. We visited the download page, it detected our platform, displayed the Windows download link, and we grabbed and installed the software in something under a minute. The client opens by displaying its many locations on a map. This works much like any other dynamic map you've used – left click and drag to pan around, spin the mouse wheel to zoom, hover your mouse over a highlighted location to see a tooltip of its name – and left clicking any location will connect you to the service. While this looks good, it's not a very practical system. To access a specific European location, for instance, you'll have to pan to that area of the map, zoom in so that the location marker isn't overlapped by the others, and find your location amongst the others (not everyone will look at a caption-free map and immediately recognize which country is Slovakia, and which is Hungary, for instance). Your map location and zoom level are lost when you quit the app, too, so reboot your system and you'll need to start again. Fortunately, a left-hand sidebar displays a more standard alphabetically-sorted list of countries. At its most basic, you can scroll to the country you need, click a button and get connected to the best server in that location. Very easy. Tap a More button and NordVPN displays a list of servers and cities within that country (if there's more than one). That's good news for larger countries, as for instance, knowing whether you're connecting to New York or Los Angeles might make a significant difference to performance. However, there are problems with the way the client implements this. Cities aren't always displayed in alphabetical order, for example, so our US list currently included sequences like 'San Francisco, Chicago, Dallas, New York, Buffalo, Seattle, Phoenix...', forcing us to scan down the list to find what we needed. The client also offers separate Speciality lists, where you can choose servers for a particular task: P2P access, using Onion over VPN, the double encryption of Double VPN, or giving you a dedicated IP. These work much the same as the regular list, so for example you can click P2P and allow the software to choose the fastest server for you, or browse the full set and choose something manually. If this sounds like hard work, you might have a point. You can add any server to a Favorites list with a click, making it much easier to find later, but NordVPN's odd naming conventions mean it's not always obvious what they're for. We added the client's best P2P choice as a favorite, for instance, but it was displayed in the list as 'United Kingdom #959', alongside our other favorites 'United Kingdom #565' and 'United Kingdom #768'. These couldn't be renamed, so we were left to remember which were the best for general use, and which was for P2P. Once you've figured out the locations you want to use, the rest of the client generally works very well. Tap a server and NordVPN connects within a few seconds. The client interface updates to display your connection status and the location you're using, and even better, a Windows desktop notification tells you when the VPN is turned on and off. Switching servers is easy, too. If you're connected already, you don't have to close that connection before you can open another. Just click any server and the client will automatically disconnect and reconnect to your choice. Right click the NordVPN system tray icon and you'll see a list of your recent connections, making it simple to access them again. That's a real convenience which could mean you rarely need open the full app. Elsewhere, an interesting Settings dialog has some unusual plus points. It doesn't just allow you to launch NordVPN on startup, for example. You can also have the client automatically connect to your most commonly-used server, every time it launches, avoiding any hassles from the client's usual selection process. NordVPN's kill switch (a system to avoid data leaks if the VPN connection drops) also offers more control than most. An internet kill switch blocks all access to the internet unless you're connected to the VPN, while a separate app kill switch closes particular apps if the VPN drops (your torrent app, for instance). Protocol support is limited, at least with the Windows client. You can toggle between OpenVPN TCP and UDP only, and even that is hidden away in an Advanced Settings panel. By way of compensation, NordVPN provides the option to set your preferred DNS for all VPN connections. Most users should probably leave this alone, but if you know what you're doing, replacing the DNS could improve browsing performance, help to block access to malicious websites, or add other benefits. Even better, you can add multiple DNS servers and switch between them as and when required. Put it all together, and although NordVPN's Windows client has some issues, it's generally well-presented and easy to use. Once you're over any initial setup hassles, it's a comfortable place to view and control your VPN status. The NordVPN Android app is one of the most popular around, with more than five million downloads, and a very impressive 4.4 rating on Google Play (even ExpressVPN 'only' manages 4.1). While we never assume that app store ratings are accurate, we've also regularly seen VPN apps get 1-star reviews for no good reason, as users blame them for many other network and internet issues. To rate 4.4 is a real achievement, for sure. Setup follows much the same route as any other service. Click Install, the app downloads, and you can launch it with a tap. The app opens with the top part of the screen displaying your available locations on a world map, the lower part being reserved for a server list. You already know the basic operating principles here, as they're the same as any other map you've ever used: pinch to zoom in on the area with the location you need, drag to pan around, tap a location marker to connect to it. But it's just not very practical. You might have to zoom in a long way to see the area you need. Do that on Europe, say, and you could be faced with 40 location markers but no text captions, so if you want to choose Macedonia, you'll need to know where it is on the map. And switching somewhere else in the world might require zooming out, panning around and zooming in somewhere else. While this isn't difficult, you're still spending more time navigating the app interface than we would like. Fortunately, and just like the Windows client, NordVPN's Android app also supports a conventional countries list. Swiping up gets you an alphabetical list of countries, and you can scroll down to the US (or anywhere else), tap it, and immediately get connected to the best server in that country. The NordVPN app uses the standard OpenVPN for Android software layer to make and manage your VPN connection, and that's a smart move. Users don't have to hope that NordVPN can produce the code to make its VPN connections correctly, because it’s already using a known, trusted and reliable product which can do exactly that. If you need more control over your location choice, tapping a Menu button displays the full list of locations in that country. The Android app now displays its servers by region name, too, instead of cryptic server numbers (Los Angeles, rather than 1284.) We're surprised it took this long, but the change does make the app far more convenient to use. You can expand locations to list all their individual servers, too, although as there's no server load or other information, this probably won't help you very much. As usual with mobile software, the Android app also has fewer settings than its desktop cousins. In particular, there's no separate kill switch and no option to choose your own DNS servers. What you do get is get ad, phishing and malware-blocking via NordVPN's CyberSec, and a smarter auto-connect exclusion option. For example, you could set up the app to automatically connect on all Wi-Fi hotspots apart from your home and other trusted locations, ensuring you only turn on the VPN when you know you need it. The app isn't quite perfect, then, and we're not sure the map element of the interface adds a lot. But otherwise it's a likeable and capable application which outperforms most of the competition. The NordVPN iOS app installed easily and with precisely zero surprises. Find it in the app store, install, open, log in and you're ready to go. The app opens with the same slightly awkward map interface as the other clients, although the iOS developer has done a marginally better job of implementing it. You can't zoom out as far as the Android app allows, which means the individual location markers are never left overlapping and hiding each other. And when the map is displayed, the lower panel reduces to just enough space for a Quick Connect button, leaving the maximum screen real-estate for map details. We still think a map isn't the best way to switch between locations, but if you agree, swiping up displays the regular country list. Here you can connect to any country with a tap, or choose individual regions and servers if you prefer. It's not all good news, though, and unfortunately the iOS Speciality Server list is a little shorter than the others. You can view and select servers optimized for P2P or that support Onion over VPN, but there's no Double VPN or Dedicated IP option. That's not a huge deal and the Double VPN feature won't be necessary for most users, anyway, but if NordVPN is trying to sell itself on that kind of extra, we'd like to see it available on all clients. The iOS app's Settings panel is also relatively basic. The good news is it has a kill Switch which disconnects you from the internet if the VPN goes down, a welcome privacy plus. NordVPN has also added the malicious IP filtering CyberSec since our last review, another welcome touch. But you don't get TCP or UDP protocol control, auto-connection or the Obfuscated Servers feature (handy for getting online with countries with restrict the use of VPNs). That isn't entirely NordVPN's fault – Apple's security model places strict limits on what apps can do – but it's something to keep in mind if you'll be mostly using the VPN on your iPhone. VPN clients are generally easy to use, but getting yourself connected can still take a little work. If you need to unblock a website on your Windows laptop, for instance, you might have to click to display your system tray icons, click again to display the client, click the Countries tab, expand the full list of servers, click your preferred option, wait to see when you're connected, and finally Alt+Tab back to your browser. 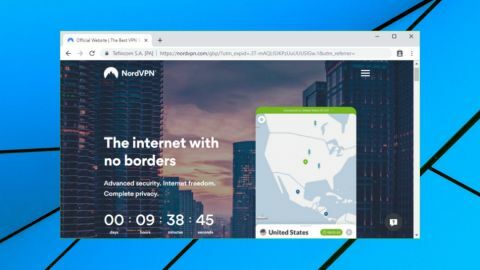 NordVPN offers Chrome and Firefox proxy extensions which can simplify this process by allowing you to choose a VPN location, then connect and disconnect directly from the browser window. Installing the Chrome extension added a NordVPN icon to our system tray. We tapped this and logged in to the service when prompted. The extension interface doesn't have the map you'll see in the clients, but that's no great loss. Instead you're presented with an Auto Connect button which connects you to the fastest server, and a Choose Location option which enables selecting a particular country only. (There's no ability to choose a particular server within a country; NordVPN will decide that for you). A small Settings dialog allows you to block WebRTC leaks in Chrome, reducing privacy risks, and you can also enable or disable the ad, phishing and malware-blocking CyberSec feature. We checked out NordVPN's Firefox addon, too. Sometimes VPN capabilities can vary between browser extensions, but not this time-- NordVPN's Chrome and Firefox addons had identical interfaces and functionality. Overall, this isn't as capable a setup as you'll see with some of the competition. ExpressVPN's browser extensions control and work with the full ExpressVPN client, so once you enable them within your browser, they protect your entire system. The NordVPN extensions are simple proxies, and protect your browser alone. Still, the proxy approach is perfect for simple website unblocking, connections are much faster, and using NordVPN within a browser could be useful in a few situations (some of your apps don't work with a VPN, for instance, or the VPN reduces your system performance). We're happy that NordVPN offers browser extensions at all – most VPN providers don't – and overall, it's a plus point for the service. NordVPN's first line of defense is its support website. Articles are sorted into sensible categories (Getting Started, Connectivity, Billing, General Info), and a search box allows you to find articles by keyword. The knowledgebase isn't bad, and there is some useful information here. Type Speed into the search box, for instance, and the website displays a 'Speed and Bandwidth' article with plenty of relevant tips (restart devices and routers, try another location, another network, change your protocol settings, and more). NordVPN's opening Help page also fails to mention any other help resources. ExpressVPN's support page includes links to launch live chat, open a support ticket or send an email to the support team, for instance. NordVPN's page doesn't even tell you which of these options are available. Scrolling down, finding and clicking Contact Us will give you the details, but that shouldn't be necessary; if someone's clicked Help, you should present them with all their options up-front. Despite these small hassles, there's good news here, too. If you ignore the default article lists and use the search tool to find what you need, there's a lot to like here, including a large number of quality setup tutorials. The company does offer live chat support via a Help icon in the bottom-right of the screen, although during our review, curiously, this wasn’t visible on browsers that had uBlock Origin installed. When (or rather, if) you figure that out, the chat system works very well. We posed a simple question and received a friendly opening response from a support agent in around 30 seconds. If you prefer to send an email, perhaps to include logs or screenshots, it seems like the '48 hours' warning is a worst-case scenario. We sent a test email at 9:29pm and had a helpful reply at 9:10am the following morning. That's not great, but it's comparable with many other VPNs, and the response we received was accurate and detailed enough to solve our problem. An appealing VPN which is fast and (mostly) user-friendly. It's let down a little by the awkward map-based interface and occasional connection issues, but overall, it's a likeable service which will deliver for most users.